Lisa Ekdahl is a Swedish, audio DIYers may have so guessed as they must have heard of Lundahl transformers. Ever observed "dahl" makes a common part of numerous Swedish words. From just quick surf, anyone may find "Lisa Ekdahl Sings Salvatore Poe" (LESSP) as this album has been much raved about. But well, I am not saying it is not good stuff though by now you should have recognized that I prefer to introduce/re-introduce and share less-famous stuff. Moreover by its very nature, LESSP contains mostly Bossa Nova materials, if not wholly. I detest Bossa Nova-hangover, not track after track of Bossa Nova OK!!! So... What is the doodle this time around? Of course it is from Lisa but other title i.e. Back To Earth! This was published in 1998/99, quite some time ago. 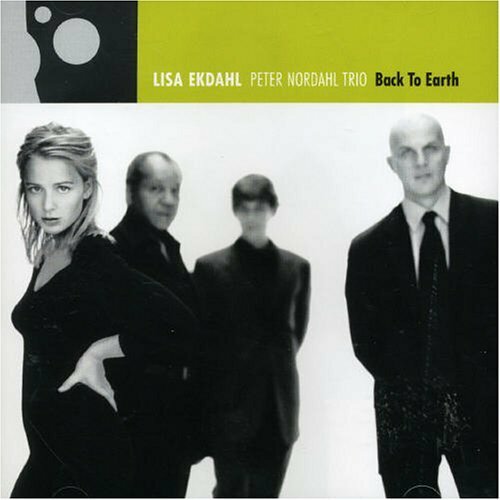 This is a piece of collaborative work with Peter Nordahl Trio (see another "dahl"). I reckon the Trio is made of, amongst others, Peter but please do not ask me more! Probably in short, I should say that the Trio makes very good jazz accompaniments with piano, contra bass and drums. Must you ask who plays what instrument; make your guesses from the photo! Applying some conceptually similar methodology like DAC Oversampling- Interpolation, through Lisa's vocal, styles, talents etc musical attributes, I could "see" that she was pretty sweet young girl. I never saw her photo when I was first introduced to her LESSP album and yes, true enough: Pretty sweet young girl, she was indeed!!! Physical outlook aside, anyway my music friends, back down to earth... Back to Earth is my first and the only album of Lisa thus far. No comparison with her performances in some recent albums. As captured in Back to Earth, Lisa sings with child-like vocal. There is much naivety and playfulness perceived, certainly very relaxed mood at times. Lisa's vocal and style are somewhat reminiscent of Blossom Dearie and of Billie Holidays due to some little babyish elements in her vocal structure, but please be assured that Lisa never shows any "symptoms-of-trying" at all, she sings the way she naturally does, she sings her own styles living not in the shadow of any other artist! This is one of my favorite tracks which I reckon first-time listeners could find good chance of appreciating her styles not forgetting to mention the sizable room assumed by the flawless trio accompaniments. despite the infectiously agitating beats! Remember that I am not here to compare Lisa with others especially when she sings jazz standards, neither is this a review to judge Lisa against any established standards/guidelines. But please note, Lisa could have been inspired by Blossom Dearie and Billie Holidays somehow then developed into her own styles. No worry if you have yet to like Lisa's stuff, after all the album is just one-of-its kind-styled, quite an acquired taste eh! Hear her art with your heart!